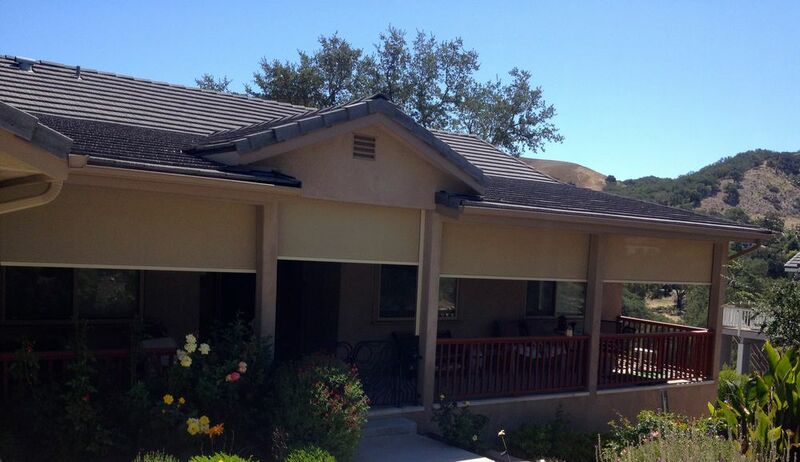 Traveling along vertical stainless steel guide wires, the Patio-Pro's fabric rolls up or down to provide excellent & durable protection against heat, solar damage, inclement weather and even stray golf balls. The fabric is additionally secured by a weighted bottom bar. Unlike a box & track system, the cable system drop shade can be mounted onto inconsistent surfaces such as rock, brick, slanted fascia and under eaves. The stainless steel fittings used throughout construction, as well as installation, guarantee the hardware will last virtually forever. Electrically: Using a weatherproof UL approved SOMFY tubular motor contained within the roller tube. All motors have thermal protection and built in upper and lower limit switches. Manually: Operated using an exterior worm drive gear. Automatically: Optional devices such as hand-held remotes, multiple group remotes, timers, wind & sun sensors that can activate your product regardless whether you're home or not.